Anne E. Johnson has published many types of writing. Her non-fiction works include feature articles about music for the New York Times and children's books for the Rosen Group. Her more than twenty short stories have appeared in Shelter of Daylight, Underneath the Juniper Tree, Spaceports & Spidersilk, and elsewhere. She has three novels contracted for publication in 2012. Anne lives in Brooklyn with her husband, playwright Ken Munch. Miranda: Thanks for joining us Anne! You've got some impressive degrees, plus you study the craft of writing quite a bit. How important do you think it is for writers to have a solid foundation in writing? Is experience the best teacher or do you think classes are necessary? The first is to develop a reading habit. Whatever type of fiction you think you want to write, that's what you should be reading the most, so you know what's been done, and you know the history of the genre. Read every day, and read widely. Don't just read new things. Read the classics. The second is to take a class or two about literature. Learn to analyze it. Learn what makes a great story arc, great characterization, great rhythm in language. Yes, this is supposed to be taught in a writing class, but in my experience the way to learn it is by puzzling out how the masters do it. The third step---after you have a reading habit and are getting some critical skills to apply to your reading---is to start writing. Write, write, write. And be very self-critical. This does NOT mean to hate everything you do, but to be open to improving everything you do, and to analyze it in the same way you would classic literature. Miranda: Good points. Now, I happen to have been following your blog and notice you also write very quickly. Tell us what happens after you write. Do you have a critique group? Editor? Self-Edit? Anne: First I do at least two rounds of self-edits. Then I send the manuscript to my beta readers. This is a set of five or six people who consistently read my work at this stage. They don't meet together as a group to discuss the manuscript, but read it and comment on it individually. The advantage of this approach is that I get five or six distinct perspectives, not influenced by each other. And the comments often conflict, which can be frustrating, but is ultimately quite valuable. Miranda: I hear you on the valuable but frustrating part. Thanks for sharing a bit about your process. Now, let’s talk about content. You write a lot including subjects you're passionate about. How important is it to "write what you know?" Anne: I think that including subjects you're passionate about as flavoring and setting is completely different from "writing what you know," a concept that doesn't work for me at all as a fiction author. Fiction, for me, is about imagination. As a writer, I would feel very constricted if I limited my main characters' experiences to my own. Where would I draw the line? No male characters, just because I'm female? No characters of color, because I'm white? No uneducated characters, just because I went to grad school? No characters older than myself? Miranda: Great distinctions! Perhaps we can also talk about reading and researching – which I know is often essential for both fiction and nonfiction authors. Explain how important those elements factor in to successful writing. Anne: I've already mentioned my feelings about reading in general. If you're writing historical fiction, good research skills are central to your job. And don't just Google your topic! Get yourself to a brick-and-mortar research library. Let a librarian help you if you don't know where to begin. Use the work of academic scholars to expand your knowledge of the chosen time and place in a really profound way. Once you feel like you know what that world was like, only then should you even begin plotting. One of the tricks of historical fiction is to have done so much research that your research doesn't show. The world should just flow out naturally. Once I saw the line "She ran toward him in a dress dyed with beet coloring and probably made of flax." Those unnecessary details about the dress derailed the energy of the narrative and made me picture the author reading a Wikipedia page. It's fine to sneak in interesting historical facts, but the key word is "sneak." Miranda: Sneak! Great technical term for it. I think we all get what you mean. Now, written stories aside, let's talk about your life stories. You've got some interesting ones. Tell us five things about yourself most Rate Your Story readers might not know. 1. In high school, my friend Mary and I won an award for our dramatic reading of the scene from The Hobbit in which Bilbo Baggins meets Golem. I played Golem. 2. From age 14 to 21, I sang Irish and Scottish folk music professionally, accompanying myself on guitar. 3. My favorite movie is City of Lost Children. 4. I discovered Robert Heinlein's novels when I was a teen, and I've been a science fiction fan ever since. 5. Last year, during a trip to Los Angeles, my husband and I visited the Grammy Museum. The top floor is an overview of all the many genres that have contributed to American music. I stood in the middle of that exhibit and wept because I was so proud to be part of this species that could create so much beauty to express themselves. Miranda: All right, let's get to your books. Congrats on all your recent successes! Can you share with us the titles and release dates of the books and where they are/will be available? On June 1, my tween paranormal mystery novel, Ebenezer's Locker, will be released as an e-book from MuseItUp Publishing. On June 19, my noir-inspired science fiction novel (for adults), Green Light Delivery, will be published by Candlemark & Gleam. In July, my tween medieval mystery novel, Trouble at the Scriptorium, will be published by Royal Fireworks Press. You can read synopses of all of these works, plus see other news about my writing and appearances, by visiting my website. Miranda: Thanks so much! Now…the hardest question of all. Do you think you can find a way to finish off this interview with an awesome ending for our aspiring writers? Anne: Every person is different, but my own experience has shown me this about being a writer: If you have stories to tell, then write them. Don't expect writing well to be easy. But you can be sure that, the harder you work on your writing, the greater the joy it will bring to both you and your readers. Miranda: Thanks, Anne. I am sure that our Rate Your Story readers will be sure to check out your website. Thanks for visiting. Comments are OPEN below if you'd like to thank Anne or if you have a question to ask. See you all next week when I'll be posting the interview with Kelly Hashway from Casablanca, Morocco (on World Read Aloud Day!). Margot Finke is an Aussie transplant who writes midgrade adventure fiction and rhyming picture books. For many years she has lived in Oregon with her husband, children, and grandchildren. Gardening, travel, and reading fill in the cracks between writing. Her husband is retired, and very supportive. He gives her lots of time to write and promote her books (yay!). Margot didn't begin serious writing until the day their youngest left for college. This late start drives her writing, and pushes her to work at it every day. Margot said, "I really envy those who began young, and managed to slip into writing mode between kid fights, diaper changes, household disasters, and outside jobs. You are my heroes!" Her Manuscript Critique Service attracts clients from all over the globe, and her website offers a great deal of help for new writers. Nothing gives her a bigger thrill that to hear that a book she helped polish has been published. “This is always a huge YEA moment,” Margot says. Miranda: Welcome, Margot! So excited to have you - it's been awhile since we last chatted via Skype, too, so we'll have to do that again. Now, let's begin at the beginning. Tell us about the first thing you ever wrote. Margot: Oh dear, mate, that’s going back into the dark ages. I had been to the movies with my parents to see “Lassie Come Home,” and like millions of other kids at the time, I fell in love with the dog. I wrote a story about her having another adventure with the boy in the series – I forget his name. I ended up with an epic about Lassie and her brave deeds. My parents thought they were wonderful. I desperately wanted a dog like Lassie. Margot: I have several unpublished picture books that I think are super good – hey, they ARE my babies! They are tight, terrific, and leave kid readers with a cool yet intelligent message. Unlike many of my published picture books, neither are in rhyme. In “Kobi Koala Borrows a Pouch,” a young koala thinks he is ready for a tree of his own. He runs away from home, gets warnings and advice from other bush critters, and ends up lost. Kobi borrows Milli-Milli Kangaroo’s pouch while he searches for his old home tree. He discovers Mum is right – learning bush smarts does take time. The other is “Oscar Needs a Friend,” a tale about not judging a Tasmanian Devil by how he looks. Oscar is different. He does not eat other critters. He is not nasty. But he is ugly, and he does look like his relatives. Oscar searches for friends, and his wish to be accepted by the other bush critters brings disaster, danger, and a wake-up call for those who only judged by appearances. I love both these stories, and so does every child I have read them to. Miranda: That's so awesome to hear that a published writer also believes in her unpublished works. And, it's also a reminder of taking joy in pleasing our audience - as many Rate Your Story followers also write for children! Now...let's talk getting published - tell us about the first book you published. Margot: Kangaroo Clues was the first book I had published. It became the first book in my “Wild and Wonderful” rhyming series. 7x individual rhyming books that tell fun facts about animals from the US and Australia. This one is particularly memorable, because how I found the illustrator gives the Internet a bright gold star. Imagine this: the illustrator was from Turkey, he spoke no English, and did not own a computer. How was this possible you ask? This friend acted as translator for both of us. Talk about a marathon effort. I will always be grateful to her. Fortunately, Mustafa lived near her, so she went back-and-forth for months with my e-mails, and his replies to them. How do you argue with someone in another land, when you can’t see, hear, or speak his language? Oh boy, trust me, we found ways to argue. Almost a year went past before the illustrations were completed, and the book was finally published. I was thrilled with the results - worth every hair tearing moment. His magical illustrations came together with my rhymes in a delightful marriage of fun reading. The picture book offered information kids could enjoy, while learning about Aussie animals. Miranda: What a great worldly story! Now tell us about the other books! Margot: * Don’t Eat Platypus Stew – *Never say BOO to a Frilly - Mama Grizzly Bear – Humdinger Hummers – *Prairie Dog’s Play Day – *Squirrels Can’t Help Being Nuts. These six complete my Wild and Wonderful series. **Both these include helpful parent/teacher guides. ** See all these books on my website: http://www.margotfinke.com + Video readings, reviews, book trailers, covers and writing samples. Miranda: What amazing accomplishments. And, you also help new writers build their careers and tweak their writing through your manuscript critique service. Can you shed some light on mistakes that many writers make? #1 - Waffling on too long. Waffles should stay in the kitchen with the maple syrup. #2 - Limp and over used words. Powerful and active words make a powerful and active story. #3 – Lack of focus. Allowing your plot to wander off down sidetracks that lead nowhere. ** Any one of these three is sure to earn your MS a rejection. All thre. . . KABOOM! Miranda: Thank you! Great advice. Now...the nitty gritty...as a children's writer, you've realized the publishing landscape has gotten pretty competitive and narrow. What are three pieces of advice you have for "Pre-Published" children's authors? #2 – Do your homework – whether you are self publishing or trying to decide on the right publisher. Make sure your final choice is a legitimate, and not some scammer wanting to pounce on your money. #3 – Set up a good Blog or website, and promote your book before publication. Get a buzz going. Make your name, and that of your book, a familiar site on Facebook, Twitter and GoogleX etc. Miranda: Ok...and if we need help with some of these points...where can a writer get an in-depth critique of their work from you (not just a basic critique on Rate Your Story)? Margot: I love helping writers polish and fine tune their pages. If you want to cut the waffle, focus on what is important to your plot, and craft rich and intriguing characters, I can help you. Writing “as tight as your granny’s new girdle,” is easy, once you get the hang of it. E-mail me < mfinke@frontier.com > we can chat about your manuscript. Miranda: Now, as you know, I love humor! Tell us a funny story to end the interview, please! This happened one Saturday when I was a kid around twelve. Our Scotch Collie, Peggy, was due to have her first litter of pups. The time was imminent, but Dad insisted “No way,” and went off to town. Mom thought otherwise, has no experience in birthing puppies, and was uneasy about being left in charge. Well, Dad was hardly out the front gate before Peggy began to show signs that Dad’s NO WAY was fast becoming a big, YES WAY! Gran and I were flabbergasted. My mom was no drinker – she got tiddley on the smell of a cork, or the rum in Christmas pudding. Yet calm ensued. Peggy gave a sudden push and a yelp. Mom cried “You little beauty!” and out popped #6, followed in fast succession by 4 more bundles – 10 in all. Mom sat in the chair, a huge grin on her face. She kept telling Peggy what a wonderful team they made. I was out of my skull with excitement, and ran to tell all my mates. Head up, Mom walked toward the back steps. She only stumbled twice. Gran and I fell into each other’s arms and giggled our socks off. Miranda: And now I'm giggling my socks off. Thank you so much, Margot - for this interview and all of your hard work s a volunteer judge with Rate Your Story. Hooray! It's Author Interview Wednesday again! Simon was born in Derbyshire, England. He graduated from university with a degree in history and has lived in Canada since 1990. He is also a graduate of the Institute of Children's Literature of West Redding, CT. Simon and his two children, dog and cat live in Calgary. 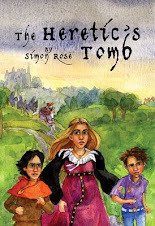 Simon’s first novel for middle grade readers, The Alchemist’s Portrait, was published in 2003 followed by The Sorcerer’s Letterbox in 2004, The Clone Conspiracy in 2005, The Emerald Curse in 2006, The Heretic’s Tomb in 2007 and The Doomsday Mask in 2009 and The Time Camera in 2011. The Insistence of Memory, a novel for young adults, will be published in 2012. Simon is also a contributing author to The Complete Guide to Writing Science Fiction Volume One, has written several non-fiction books for younger readers with Weigl Educational Publishers, and works as a writer for Dark Roasted Blend online magazine. Simon offers a wide variety of presentations, workshops and author in residence programs for schools and libraries, covering such topics as the writing process, editing and revision, where ideas come from and how writers turn them into stories, character development, historical fiction and historical research, story structure, the publishing world and more. He also offers virtual author visits by video using Skype. He works as a creative writing instructor for home school students throughout the year and at summer camps each July and August, is an instructor for adults with the University of Calgary, Chinook Learning Services and offers a variety of online workshops for both children and adults. Simon is a regular presenter at conferences and festivals, and served as a juror for the Governor General’s Literary Awards for Children’s Literature, the Saskatchewan Book Awards, the Parsec Awards and the Sunburst Award for Canadian Literature of the Fantastic. He is the founder of Children’s Authors and Illustrators on Facebook, served as the Assistant Regional Advisor for SCBWI Western Canada and organizes the Calgary Children’s Book Fair and Conference every November. Simon offers a number of services for writers, including manuscript evaluation, editing, writing workshops and coaching, plus copywriting services for the business community. Miranda: Whew. That's impressive. With an intro like that, what else can I ask? Hmmm...Let me try. Did you always want to be a writer? Simon: No, not really. Once I had children of my own, I came into contact with children's books again for the first time in many years. Picture books initially, of course, but then early chapter books and novels. When I decided to try my hand at writing novels and stories, I found myself drawn to the types of things I used to read as a child. I read lots of science fiction, as well fantasy writers and ghost stories while growing up. I also read a tremendous number of comic books, in which the stories took me across the universe, into strange dimensions, into the land of the Norse gods or had me swinging from the New York rooftops. At high school, I studied a lot of history and have retained my interest in the subject up to the present day. I also read voraciously on ancient civilizations, mysteries, the supernatural, and the unexplained. Miranda: Interesting that you began with picture books. I think a lot of Rate Your Story submitters are starting with those too! But some also write MG and YA and are seeking publication. Which brings me to ask - At what point did you begin to know your writing was good enough to get published? 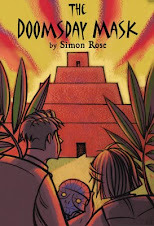 Simon: I took a writing course with the Institute of Children's Literature and began submitting stories and ideas to publishers around the same time. Shortly afterwards, publisher took an interest and the first novel was published in 2003. The rest, as they say, is history. Miranda: Great to know! I also took their writing course and found it to be very helpful especially in terms of revision and marketing my work. The instructors are very helpful. And you're a teacher too, right? What are the top three things that you tell students about writing stories? Simon: 1) Don’t be afraid to revise and revise over and over again. Most authors go through many revisions before their work reaches its final format. 2) Remember, too, that your book will never be to everyone’s taste, so don’t be discouraged. A firm belief in your own success is often what’s necessary. After all, if you don’t believe in your book, how can you expect other people to? 3) Read as much as you can and write as often as you can. Keep an ideas file, even if it’s only a name, title, sentence, or an entire outline for a novel. You never know when you might get another piece of the puzzle, perhaps years later. Miranda: Great advice. Now since you mentioned outlines...which I'm not always good at...Do you begin with an outline? A character? A chapter? Tell us a bit about your writing process. Simon: I always create a detailed outline of a novel before I start work, but not all writers work this way, no matter what their preferred genre. The outline is usually a paragraph for each chapter of the book and can be as long as 10,000 words, depending on the length of the novel. Miranda: Impressive. Then what happens? How many times would you say a book gets revised before it finally makes it to print? Simon: Writing is in some ways the easy part. It can be a very long process not only to write a book, but also to get it published. A book is a marathon measured in years rather than weeks or months. Depending on the length and reading level of the book, as well as the experience of the author, it can be revised ten or twenty times. However, there are obviously no set rules about this and every project is different. Miranda: Now, der, hey - you're from up there in Canada (*waves across the lake*). Is the Canadian writing scene different than the US? We've had submissions from around the globe, so I'm wondering if you see the landscape for writers as different up there. Thoughts? Simon: The scene is probably pretty much the same, although there are more publishers in the USA and more people submitting to them. Miranda: It does seem like slush piles are quite large here! I just received an acceptance after seven months of waiting (for a short magazine piece!). So, Simon, can you leave all of us writers with some strong advice for how we can establish ourselves in such a crowded industry? Simon: If you become a published author, you also mustn’t forget the marketing. You may produce the greatest book ever written. However, no one else is going to see it if your book doesn’t become known to potential readers. Be visible as an author. Do as many readings, signings, and personal appearances as you can. Get your name out there and hopefully the rest will follow. Especially for newly published authors, books don’t sell themselves and need a lot of help. Miranda: Again, great advice. Now where can everyone find out every speck about you that we may not have covered here? Simon: My website is www.simon-rose.com. You may also visit my blog at simon-rose.blogspot.com, my channel on YouTube, follow me on Twitter or become a fan on Facebook. Miranda: I think that covers it! Thanks so much, Simon. Congratulations on all your successes and on behalf of all Rate Your Story visitors, thanks for the wonderful service you provide. Comments are open below if you'd like to send Simon a message. And don't forget to stop by next Wednesday for an interview with Rate Your Story judge Margot Finke! I couldn't think of a better way to kick off our new Series (and keep the site active while I romp around Africa) than to present for the world our AMAZING – and widely published – panel of Rate Your Story volunteer judges. These guys have been working hard, for free, reading your manuscripts and generously offering guidance in the form of ratings and comments, a real testament to the awesome #kidlit community! 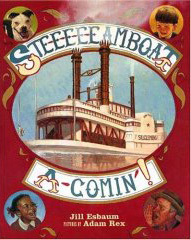 Jill Esbaum is the author of eleven picture books with major publishers, including the award-winning Ste-e-e-e-amboat A-Comin'!, Estelle Takes a Bath, Stanza, and her latest, Tom's Tweet (illus. by Dan Santat). She is a former instructor for the Institute of Children’s Literature, and, in addition to critiquing picture book manuscripts privately, she is a longtime workshop facilitator at the University of Iowa Summer Writing Festival and co-hosts the annual Whispering Woods Picture Book Writing Workshop. Jill and her husband live on a family farm in eastern Iowa. Miranda: Hi Jill! Thanks for agreeing to be interviewed. Let's get right to the heart of why you're here–you're a master storyteller. So tell us, besides a beginning, middle, and end - what does a story need to have? Jill: Spark. Something that sets it apart from everything else the editor – and kids! (and parents and teachers and booksellers) – have seen. Miranda: Great. Now let's get down and dirty with Rhyme. We seem to get a lot of rhyming picture books submitted to Rate Your Story. What tools do you use when you're writing a rhyming story? Jill: Rhyming stories look like the easiest thing to write, but are, in fact, the toughest. The thing to remember when writing a rhyming story is that three elements have to come together: rhyme, rhythm, and story. And ALL have to be perfect. Tool-wise, I need my Webster's Rhyming Dictionary and a good hard desktop on which to bang my head repeatedly. Miranda: Hope you've got good medical insurance! Now, let's get a little more serious. Tell us about the historical and nonfiction research you've done. Do you research before a story, during, or after the first draft? Any advice for writers who have submitted these kinds of stories? Jill: Yes and yes. I research extensively before writing anything. Often, even after a piece is roughly planned out, something I read or someone I speak with will send me in a different direction entirely, ultimately enriching the story. But research is needed throughout the process, too. 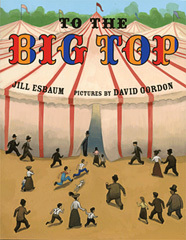 When I was working on To the Big Top, for example, I read everything I could get my hands on to learn what circuses were like at the turn of the (last) century. After the first draft, I was e-mailing back and forth with a circus museum archivist to tweak certain descriptions. I asked what a sideshow barker wore and found out that they were actually referred to as talkers. Oops. Miranda: Ok. Enough about you (just kidding). What's your favorite story or picture book written by someone else? Jill: Right now, I love, love, love Calvin Can't Fly by Jennifer Berne and Keith Bendis. Everything about it works. Miranda: Maybe it's not fair of me to ask...but I want to so I will: What's your favorite piece of your own writing? Jill: Hmmm. I really like a picture book that's coming out next year from Dial, I Am Cow, Hear Me Moo! It's a rhyming story I first "finished" more than ten years ago. It stunk. But I loved the characters, a cow named Nadine and her two friends, Starla and Annette. Over the years, I must have tried them in five different stories, until I finally found the one that worked – and gave me that "d'oh, of course!" feeling. Whew. Miranda: Are you working on anything now? Jill: Yes, a humorous picture book story and a middle-grade novel. Miranda: Of course, I should have guessed. You're great at humor. Can you end our interview by telling our readers a funny story about your writing or path to becoming published? Jill: Oh, jeez. Well, probably the funniest story has to do with getting published. It happened at my first writing retreat in 2000. I'd been so keyed up the night before the trip, I hadn't slept at all. The 3-hour drive to the retreat was a 4-hour, white-knuckled nightmare, thanks to a late-spring snowstorm. I soaked up the Friday afternoon talks and enjoyed schmoozing at the evening festivities, but ... no sleep that night either. Unfortunately, I'm no coffee drinker. I drink an occasional Pepsi, but I hadn't been able to find one anywhere in the facility. So I'd been lucky enough to score a one-on-one crit with a dream editor (a guy), which was scheduled at 4:15 on Saturday afternoon. By then, I was barely functional. Fifteen minutes before, I went to wait in the hall and discovered a Coke machine in a niche I hadn't seen before. Yay! I chugged a can of Coke in an effort to wake up. Boy, did I. By the time I walked into the cozy little crit room, I was shaking and as wired as Woody Woodpecker. First I fell into an overstuffed chair and said something bright like, "Let's take a nap and just PRETEND we had a critique." Dream editor laughed a little uncomfortably (and eased away a few inches). Then, while he attempted to tell me what he liked about my submission, I interrupted him time and again, unable to shut the heck up. At one point, I slapped a hand over my own mouth – somebody had to. I was almost in tears; it was horrifying. Luckily, he had a great sense of humor and ended up buying my first picture book – Stink Soup – eight months later. 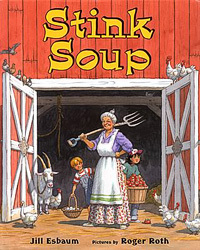 Miranda: **gigglesnorting** Stink Soup is my daughter's favorite of your stories! It was actually the first autographed book I ever gave her, too, and we thought of it yesterday when a skunk sprayed our neighborhood and she plugged her nose all the way to school. Thanks so much for letting me interview you and I think our readers will join me in saying thanks for lending your professional writing talents to Rate Your Story. Can you let everyone know where they can read more about your books, buy them, sign up for your Whispering Woods retreat, or hire you to critique their manuscript in full? Comments are open below. Let us know what you think! With the absolute takeoff of Rate Your Story since it first began in October, we'd like to begin stepping things up a notch. And a first step would be dumping replacing Miranda's crappy homemade logo. Think you can help? If you can do better than this, please email us! A new logo design that's modern, original, and fits the theme of Rate Your Story. We're seeking something professional yet inviting, that will both draw attention to and represent what we do – giving writers a number rating critique on their story drafts. In addition to a logo, we'll need the graphic in digital format in a number of sizes - which might mean a few variations of the same logo. Although we can't offer artists the loads of cash they deserve, Rate Your Story will credit the artist chosen with their name, links to their site, and all kinds of praise, Tweets, and love. In order to apply to illustrate a new Rate Your Story logo, please send an email to rateyourstory@gmail.com with the following information: Name, very brief bio, and a Link to Portfolio online (or attach up to three JPEG files if your work samples aren't online). Also state what kind of timeline it would take you to design a new logo/banner/badge for the site. Optional: If you want, you can submit a text description or a sketch description of your design ideas for us to consider. Please note that you don't have to come up with a design first to be considered. Please send us this email stating your interest in being considered before March 9, 2012. We will choose an illustrator from all artists who have expressed an interest and will announce the selection sometime in late March or early April. Can't wait to hear from you! AUTHOR INTERVIEWS with amazing tips for new writers seeking publication! Don't forget to stop back this Wednesday for the beginning of our Author Interview Wednesday series - in which you get all kinds of insider advice from the published writers that make up the Rate Your Story Volunteer Judge Panel! Here's the awesome lineup - mark your calendars & spread the word!